In my first 6–12 months of business, I wasn’t really keeping any records of anything—and I don’t just mean financial records. My only system of tracking enquiries was scrolling my inbox to make sure I had replied to each person. My method of tracking my growth was a rolling number in my head of the weddings I had booked in that year. Usually, I’d forget what number I was up to, so I would end up having to pull out my calendar and count each booking I’d written in. I knew pretty quickly that my systems (or lack thereof) weren’t working. I kept forgetting to follow up with potential clients (sometimes I’d even forget to reply to an inquiry altogether—gasp!). I wasn’t tracking the reasons why I was losing leads. I had no idea what ratio I was booking vs. losing clients. Ultimately, I had no idea what was REALLY happening in my business. So, I’m here to share the importance of creating tracking systems for your floral business—with the hope that you can have a better grasp on the ins and outs of your flower biz. I’m a creative at heart and systems don’t come naturally to me, and I’m sure many of you are in the same boat. I think it’s common for business owners (particularly new and/or creative business owners) to not bother with all of the systems, tracking, etc. But even though I’m a bit of chaotic mess, I’d like to think that I’m an organised chaotic mess, and I’ve since become quite passionate about systems, analysis, and truly understanding what’s going on in my business. I created a system to track different aspects of my business—and one of the most beneficial systems has been my enquiry tracking system, which has helped me to keep on top of my clients/potential clients—and analyse what’s happening in my business in terms of my client process. I began by creating a table in a Word Document, but I switched it all over to an Excel spreadsheet, even though I’ve never been great with Excel (I love that I can easily see how many enquiries I’ve had in the month/year by looking at the numbered column on the left). But you can use whatever works for you—a different program or even just drawing a table in a notepad! Your systems might look different than mine, but here are some of the things that I’ve chosen to record in terms of my enquiry tracking. A section to track whether each client has accepted/declined/not responded so I can monitor the outcome ratio. "Other notes," which is just a section for me to write down anything I deem as important. I’ve been writing down pretty detailed notes such as the dates that a quote/follow up email was sent. If I gave that client a call, I’d make a note of it. I want to track all of those details, and you’re about to see why. For now, just writing notes next to that client’s cell is working for me, but I think I might have to edit my spreadsheet in the future so that I can tick off each ‘stage’ my client is in (i.e. welcome pack sent, phone call, quote sent, follow up sent, deposit paid, contract signed, etc.) as a visual guide. Keep in mind that the screenshot I’ve included of my spreadsheet is only a small piece of my actual spreadsheet (I also changed the names and personal details for privacy’s sake). The main reason I’m losing clients is that they don’t have the budget, which tells me that I need to look at my marketing and who I’m targeting. Instagram and referrals are the main ways people are finding me. I’ve booked the majority of clients that I’ve called before sending an email response (personal connection—another interesting topic! ), which has made me reexamine at my client process. This kind of system has not only helped me to keep on top of my enquiries (because who can remember 30+ different names/wedding dates! ), but it has also highlighted areas that are going well and those that need improvement. It’s made me take a more in-depth look at some of my processes and strategies so that I can implement new solutions and ideas. If you look at the bottom of the screenshot of my spreadsheet, you’ll see that I’ve been tracking other areas of my business by creating different ‘sheets’ in the one spreadsheet. It’s such an easy way to keep track of all those nitty-gritty business things that we all can so easily let slip and to keep it all in the one place. Bookings (obviously the client’s details, date, etc. ), to track the number of bookings per month/year. I also include the total spend to track my average booking spend. My 2020 waitlist as I don’t like booking 12–15 months in advance, so I ask those clients if I can put them on the waitlist and I’ll reach out to them as soon as I open up more dates. I’m sure there are plenty of other areas that I could keep track of, but so far this has been a great start to help me create a habit of keeping a closer eye on the ins and outs of my business. I never thought I’d love the words systems and strategies, but this little organised, chaotic, creative heart has learned to love the tedious administration involved with running a business. After all, it’s a flower BUSINESS. The flowers only play a relatively small role in it all! 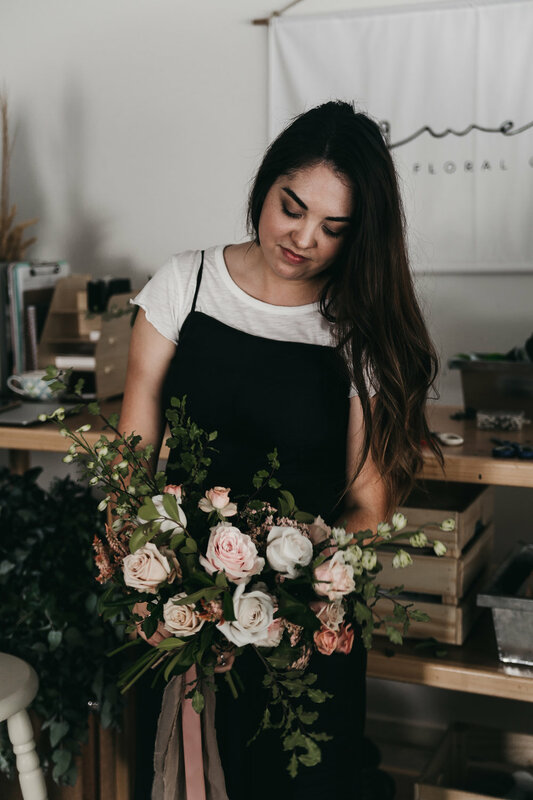 Gwen Floral Co. is a freelance floral studio created by Sarah Luthy in 2017, and is based in South-East QLD, Australia. Sarah loves creating uniquely romantic & whimsical floral designs, and is equally passionate about providing a professional yet personal experience for her clients. She loves the flower side, AND the business side! Team Flower member since January 2019.